One of the things I passed on to my children was something I really wish I hadn't, eczema. I suffered quite badly from it when I was younger, I was literally covered from head to toe in it, I itched constantly and it looked awful!! My 7 year old and 3 year old had it mildly as babies but they seem to have grown out of it, so I am hoping for them thart it doesn't come back. My 5 year old still has it but not as bad as me, it remains on the creases of her knees and elbows but I'm keeping my fingers crossed that it doesn't get any worse for her. Then there is the baby of our family. So far she only has it in one place but I think it is the worst place, her face. Everyone always comments on how sore it looks and just give general looks of feeling sorry for her, which I hate because she is fine. At the moment we are using Eucerin but it is making little difference. However the constant change in weather and temperature really doesn't help, added in with a constant cold, her immune system isn't at it's best to fight it. It doesn't look to bad in this photo as the flash has taken the redness out but it covers the whole of both her cheeks. I'm hoping the warmer weather arrives soon as that always seemed to ease my eczema. Do any of your children suffer with eczema? Do you have any creams etc that you would reccomend? The Salcura range are unbelievable for eczema, and have mild and intensive versions, (for children under and above 12 months respectively), so all your children can make use of them. 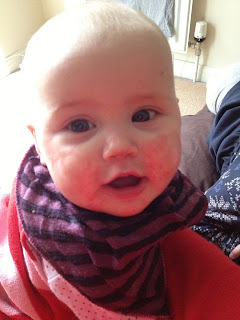 My little boy has eczema. The best things we have found are to avoid bathing every day as this dries his skin and makes it worse. Oilatum cream works fairly well for us, but we do have to resort to the steroid creams sometimes if he has a bad flare up. Sunshine helps - when we get any, and using eco balls instead of washing powder has made a difference too. See that is the problem because it is on her face steroid creams aren't allowed. I've not tried the eco balls befpre, do they work as well as washing powder? ?